Scribblenauts Remix is an action puzzle game developed by 5th Cell and Iron Galaxy Studios, and published by Warner Bros. It is an interactive puzzle where we use our imagination to solve the situations we face in each scene. The objective of the game is to guide Maxell in a journey to collect Starites. Along the way, however, he will encounter all sorts of difficulties, and we will have to seek imaginative solutions to overcome each mission successfully. Furthermore, we will find other people who also need our help. So far, it’s not much different from other action puzzles, based on more or less elaborated dificulties to be solved in order to progress through the game. However, the mechanics of the game is completely unique and original. In order to solve each situation, we have to invoke the object we want and use it to solve the problem. The possibilities are enormous. There are over 20,000 names of objects (including animals and celebrities) that can be materialized in the game, from a small blue tyrannosaurus up a huge bazooka. The only limit is our imagination. The game is incredibly versatile thanks to the amount of adjectives that can be attached to the names when we create the objects. This version of the game also adds a handy way to delete all objects in a scene. With just need to shake the device and the objects created disappear, leaving the scene clean to start again. Thanks to this versatility, each situation allow many different solutions, and that encourages us to challenge our friends and to share our progress on major social networks, like Facebook and Twitter. 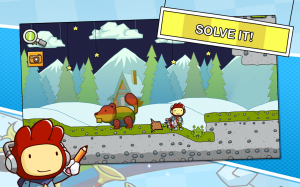 Scribblenauts Remix has 50 basic levels and some additional ones that ensure a good time of fun. 40 of those levels come from of the most popular of the old Scribblenauts and Super Scribblenauts, while the remaining 10 are original for Scribblenauts Remix. The game is available for iOS and Android, provided that you use at least iOS 4.3 or Android 3.0 Honeycomb and have 178 MB available for the iOS version and 187MB for Android devices. 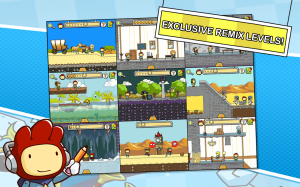 You can get Scribblenauts Remix for $0.89 on Play Store and $0.99 in the App Store.